Starting this weekend, over 325 demonstrations, marches, vigils and other public events will be held all across the U.S., covering every state, as part of the second annual “Campaign Nonviolence” week of action. Tens of thousands of people will be gathering and taking to the streets to “connect the dots” and speak out against all the issues of violence, including poverty, war, racism, police brutality, gun violence, nuclear weapons and environmental destruction, and call for a new culture of peace and nonviolence as Dr. King envisioned. Last year, we organized 238 actions in late September. This year’s week of events, with well over 300 actions, are listed and documented at www.campaignnonviolence.org and www.paceebene.org/programs/campaign-nonviolence-week-of-actions/#Actions. 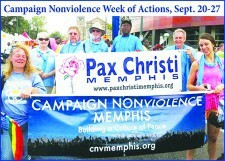 The Campaign Nonviolence week of action coincides with Pope Francis’ visit and International Peace Day, September 21st. The array of events is breath-taking. In Wilmington, Delaware, hundreds will march through town on Sunday against poverty, racism, war and environmental destruction. Near Las Vegas, Nevada, people will gather outside Creech Air Force Base, headquarters of the U.S. drone war program, to vigil against our drone attacks in Afghanistan and Pakistan. In Oklahoma City, hundreds will gather on Monday night to hear a leading African American minister engage the city’s police chief about racism and police brutality in Oklahoma. In Tucson, people will gather to vigil outside the Raytheon Missile Systems headquarters, the leading for-profit weapons manufacturer which builds drones, cluster bombs, cruise missiles, Star Wars “kill vehicles” and Mavericks. In San Francisco, people will gather at the Montgomery Street Bart Station to sing songs of peace while distributing leaflets and offering materials on issues of violence. Bangor, Maine, will host a rally to end violence. In Washington, D.C., people will gather outside the White House on Tuesday to vigil against all these forms of violence and call for a new culture of nonviolence. In Great Falls, Montana, a rally will be held at Calumet Refinery opposing Tar Sands extraction and refining. In Ashland, Oregon, their Peacebuilding Resource Faith will begin with a welcome from the mayor and the introduction of the Ashland Culture of Peace Commission. Erie, Pennsylvania, will have a vigil in Griswold Plaza. Salt Lake City will have a public rally in a park against nuclear weapons and a birthday party for Mahatma Gandhi. In Houston, activists will hold peace and justice signs along various highways and freeway overpasses. Several cities will have events all week long. In Memphis, for example, they will have an interfaith vigil, a public “fast from violence,” a forum on gun violence, another forum on racism, and still another forum on prison reform. In Raleigh, they will hold anti-racism workshops and a peace vigil. In Boise, they will host events against the death penalty, environmental destruction, protection from nuclear waste and a closing ceremony on nonviolence. Little Rock will host an Equality Summit for LGBTQ rights, a peace vigil, a public dialogue on the Pope’s encyclical on the environment, a panel on peace in the Middle East, and a food drive for the poor of Arkansas. I myself will take part in events in Washington, D.C. and in northern New Mexico, at “The Gathering for Mother Earth,” sponsored by Tewa Women United. There, at the San Ildefonso Pueblo, one of the poorest counties in the nation, located just below the mountain of Los Alamos where all our nuclear weapons are built, and one of the richest counties in the nation, indigenous women will lead workshops against poverty, nuclear weapons, and environmental destruction. I will speak on the need to deepen our nonviolence, and to continue to organize and resist this culture of violence. These pueblo women, to my mind, embody the struggle of nonviolence in our country. For decades, the nuclear weapons manufacturers have been dumping radioactive waste down the mountain onto their sacred land. They have been resisting violence every day of their lives. In their peaceful spirit, they will call us once again to wake up and protect Mother Earth and our children. As Pope Francis visits the United States this week, and challenges us to end poverty, war, executions, racism, nuclear weapons and environmental destruction, many of us will take to the streets with the same message. It is a message not heard in the discourse for next year’s presidential election, but the plea of ordinary people across the country who are sick of violence. Not only is it unusual to see a week of coordinated nationwide actions for peace and justice in the United States, it’s unusual that these events cover the whole gamut of issues involving violence and injustice. Millions of people are fed up with every form of violence, with the entire culture of violence, and want a new culture of nonviolence as Dr. King taught. Though the mainstream media does not cover such grassroots organizing, we take to the streets anyway to speak out and stand up in the hope of a building new, larger grassroots movement that will wake more people up and turn the tide of our nation. In effect, we are trying to build a “movement of movements,” based on the insight that the only way change happens in our nation’s history is through bottom up grassroots movements. Next week will mark another start in the rebuilding of that movement. John Dear is Pace e Bene’s Outreach Coordinator and an author, most recently of Thomas Merton: Peacemaker. He is a Pax Christi USA Ambassador of Peace.